To the One Billion Android™ Users: Stream Your Favorite Shows with TiVo®! Home » To the One Billion Android™ Users: Stream Your Favorite Shows with TiVo®! An all-in-one solution, the TiVo Android app enables users to discover and interact with recorded and live television from over-the-air antenna broadcasts or cable TV, as well as Netflix, Hulu Plus and Amazon Instant Video. ** Video on Demand is also available in certain markets. Now, TiVo’s Android and iOS apps* give users the freedom to watch their shows when they want! Consumers crave the ability to access content at home and on the go. With TiVo’s advanced Android and iOS apps, you can start watching on your TV at home and then continue on your mobile device as you commute, travel and go about your day. With a simple tap, you can bring up background information on both the cast and the crew for every show you watch. If you are watching content on your Android device and want to switch to your TV, a simple tap on the app will switch the stream from the mobile device to the big screen. Your mobile device doubles as a next-generation remote for your TiVo Roamio DVR. 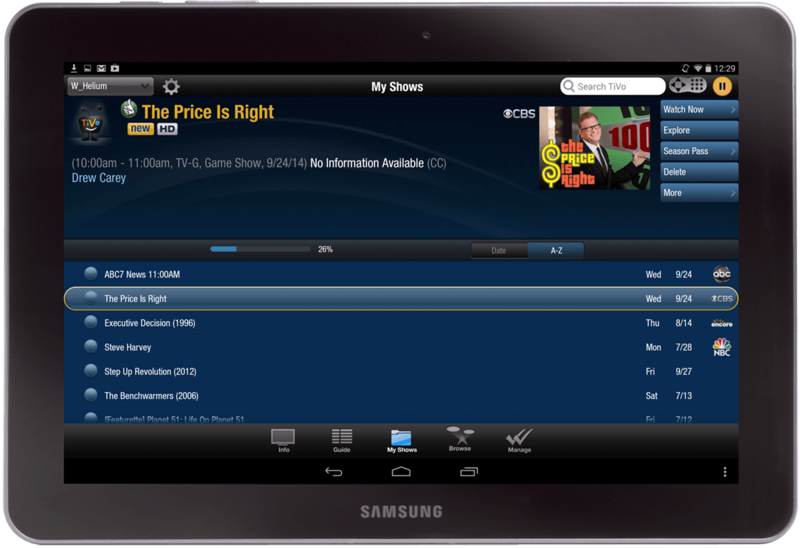 The TiVo app for Android is anticipated to be available in the Google Play Store on September 30, 2014. It also is scheduled to be available soon at the Amazon App Store. * Requires iPad®, iPhone® or iPod touch® device running iOS 5.1 or later, or Android mobile device running 4.1 or above with a non-Intel or AMD chipset (sold separately). 4-tuner TiVo Roamio DVR requires TiVo Stream accessory (sold separately). Out-of-home streaming supports streaming to only one of your mobile devices at a time. Not all recorded content can be streamed or downloaded to a mobile device (due to copy protection assigned by content provider and/or other technical limitations). Some recorded content can only be streamed/downloaded to your mobile device while you are on the same local network as your TiVo Stream or your TiVo Roamio Plus/Pro DVR (as applicable). Out-of-home streaming/downloading may not be available for all recorded content. ** Broadband internet connection required. Availability of third-party content subject to change, and certain third-party fees may apply. Netflix unlimited streaming membership required. 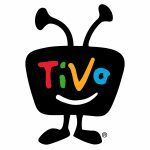 TiVo is a registered trademark of TiVo Inc. iPad, iPhone and iPod touch are registered trademarks of Apple Inc. Android is a trademark or registered trademark of Google Inc. Google is not affiliated with TiVo and does not endorse TiVo products or services. Hooray! It’s like Christmas in September! The app is working GREAT on my Droid Maxx phone, but I’m not able to stream at all with my Nexus 7 tablet after the update. I had to remove the tablet version of the app from my Nexus 7 and install the new TIVO Android app, but still wouldn’t stream. When will you have support for the Nexus 7? I’m a bit disappointed in this update. After years of using the 1.x version, I’d been looking forward to the next major release, hoping TiVo would take the opportunity to bring their app up to current Android design practices – if not “Material” look and feel, at least a reasonable facsimile of Holo (Ice Cream Sandwhich/Jelly Bean) look and feel. But they didn’t, and it still feels like a weird non-Androidy Android app. It’s got some improvements, but it still overall feels like a missed opportunity to me. LG G2, it just keeps saying “Reconnecting” while on the same network as the TiVo. Then says I’m not on the Internet and dies, wash rinse repeat. Looking forward to the bug fix! Love it on my iPad! Argh! I’m so excited about this update, but with the new app, streaming doesn’t work on any of my three Android devices — the Nexus 7, Nexus 5, or Moto X. On all three devices, “Watch Now” gives only the option to watch on my TV. I can’t wait for this to get fixed! Streaming to my tablet is a feature I’ve wanted for a looooong time. Oh: Roamio only. I have a Premiere. I’m so sad! Came here expecting a bit more detail as to what is actually required for this to work… I have a Tivo Premiere and don’t have the option to stream on the updated app on my MotoX running Android 4.4.4. Can’t download shows to Android? Fail. Seems streaming does not work from my Tivo Premiere 4 except if I am home on my WiFi (per the message on my Nexus 5). Also, no download still for Android to watch offline (like on an airplane)? What’s the point of the upgrade then? No new features. Thanks TiVo, I’ve been looking forward to this feature since I bought my Roamio last year. One question though, when will offline downloading of shows be available? I want to watch my shows on the airplane and places without Internet connections. How can I test if the Android app will complain about “unauthorized modifications” before buying a TiVo Stream? Will Android app get download capability in the forseable future? Disappointed that Nexus 7 not supported…….Booooooo! I am sick of reading articles on Android news and blogs, getting excited about new features for Android and then find that they are not available outside the USA or Europe!! There are thousands of us TiVo lovers in Australia, but seems we have been allocated “backwater status” as far as most Android updates go. My Virgin Mobile Note 2 still hasn’t been updated past 4.3 !!! C’mon guys, get with it!! Would be good if this type of Android information was checked out for Country status and mentioned in the blog. Just an idea!! I had no problem streaming on my 2013 Nexus 7. I have problems on my S4 which is rooted (as noted).